John Wilson talks to singer-songwriter Morrissey; actor Jim Broadbent discusses his latest screen role; the digital future for museums and art galleries. 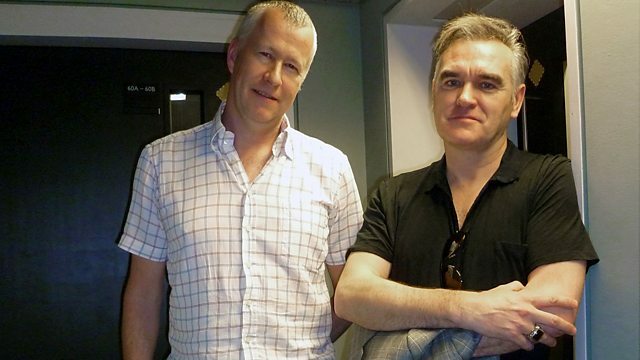 In a rare interview, Morrissey talks about David Cameron, the Royal Family and the autobiography he has written. Actor Jim Broadbent discusses his latest screen role. He won the Best Supporting Actor Oscar for his part in Iris, where he played John Bayley, who supported his wife, the novelist Iris Murdoch, through her decline into Alzheimer's. Now, in Paul Abbott's new television drama, Exile, Broadbent himself plays a man in the first throes of Alzheimer's, with John Simm as his journalist son on the trail of a dark family secret. In the third part of Front Row's investigation into the impact of digital technology on the arts, Steve Manthorp and Dr Ross Parry discuss the digital future for museums and art galleries. How important will actual exhibits remain and could the future of art be seen through spectacles worn in the street? In the third part of Front Row's investigation into the impact of digital technology on the arts, Steve Manthorp and Dr Ross Parry discuss the digital future for museums and art galleries. Actor Jim Broadbent discusses his latest screen role in Paul Abbott's new television drama, Exile. Russell T Davis, pays tribute to Elizabeth Sladen who has died aged 63.